ASPCA Pet Health Insurance was started in 2006 through a strategic partnership between the ASPCA® and Crum & Forster Pet Insurance Group. Founded in 1997, Crum & Forster Pet Insurance Group is one of the original pet health insurance providers in the US. They offer plans for accidents only, accidents and illnesses (Complete CoverageSM), and an optional preventive care options that can be added to either plan at an additional cost. ASPCA is not engaged in the business of insurance. Through a licensing agreement, the ASPCA receives a royalty fee that is in exchange for use of the ASPCA’s marks and is not a charitable contribution. Filing Claims Options Online, Mobile App, Email, Fax, or Mail. A $2.00 monthly /quarterly fee is assessed if pet owner does not choose annual payment. Does not allow upgrades to a higher payout plan until next renewal period. If you change to a higher payout plan, plan starts all over again. Prior, ASPCA Pet Health Insurance had varied customer satisfaction reviews online. Since new plans were revamped in 2016 to include an annual deductible and an unlimited payout option, customer satisfaction reviews have surged. In fact, ASPCA’s customer satisfaction review on trustpilot.com (9.5/10) is now one of the highest among the pet insurance companies. Furthermore, while no pet insurance will cover a pre-existing condition, ASPCA Pet Health Insurance will no longer consider a condition to be pre-existing if the pet has been cured and has not received treatment and had no symptoms for 180 days, or 6 months, with the exception of knee and ligament conditions. If a knee or ligament condition occurs before the coverage effective date or during a waiting period, any future ones won’t be covered. It is best to call ASPCA Pet Health Insurance customer service dept. and clarify which conditions meet this requirement. In addition, ASPCA Pet Health Insurance offers one of the shortest waiting periods -just 14 days for accidents, illnesses, and knee and ligament coverage. For multiple pet owners, each additional pet insured receives a 10% discount after the highest premium pet. Recently for a faster claims process, they introduced a mobile app. Finally, when we called and tested ASPCA Pet Health Insurance’s customer service department, calls were answered promptly, and each call was answered by a knowledgeable and enthusiastic customer service rep. They have greatly improved, and compared to other pet insurance providers, they have one of the most to offer. So if you are looking for a pet insurance provider with a long established history, flexible and customizable plans with great coverage, affordable wellness options, and improved high customer satisfaction reviews, ASPCA Pet Health Insurance could be the one to fit your pet’s needs. 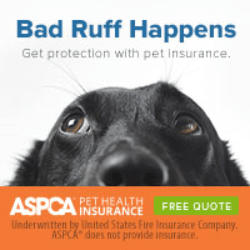 Click on Free Quote from ASPCA Pet Health Insurance banner link above, and check if their plans and prices would work for you.